It was a hot day today. I climbed up to the eastern hill of Crater I and overlooked this area. In this photograph we can see the Large Curve, where hot spring, craters and fumaroles are located along. 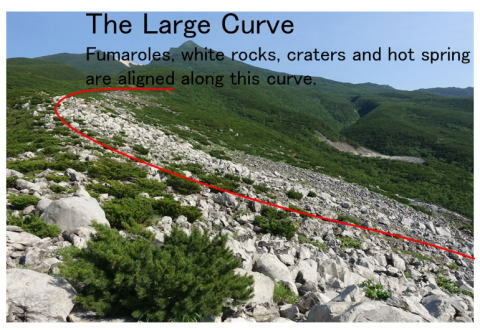 White large rocks are aligned in the curve. By self potential surey implemented in 2013-2015 volcanic activity is active around the Large Curve. I think the sulfur is being generated in an aquifer under this curve for many years and when the volcano is more active, the sulfur is melted flowed in the aquifer and erupt at Crater I.